Srinagar, Feb 12: The national highway, connecting Kashmir valley with the rest of the country, reopened on Tuesday afternoon partially for one-way after remaining closed since February 6 due to snow, landslides and shooting stones. We have allowed only Kashmir bound stranded oil tankers and Light Motor Vehicles (LMV) carrying passengers after the landslides were cleared, a traffic police official told UNI this afternoon. There is still danger of landslides and shooting stones at several places at Penthiyal and Maroog, he said adding drivers have been directed to drive very carefully to avoid any accident. We cannot say when the normal one-way traffic will be resumed as it only depend upon the condition of road as there is a fresh forecast for rain and snow during the next 48 hours, he said. 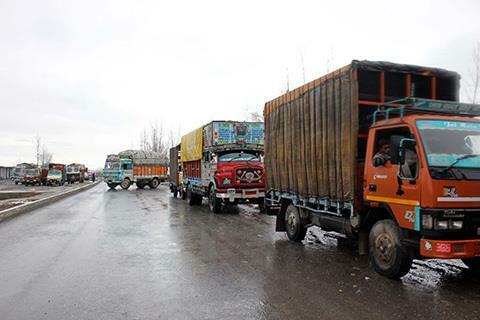 However, due to continued closure of the highway, several thousand passengers besides over 5000 trucks and oil tanker remained stranded resulting in shortage of essentials, particularly vegetables, chicken and meat in the Kashmir valley, where the prices of local vegetables increased many fold. Meanwhile, the 434-km-long Srinagar-Leh national highway also remained closed and no chance of early reopening of the only road connecting Ladakh region with Kashmir could be seen. The historic 86-km-long Mughal road, linking Shopian in south Kashmir with Rajouri and Poonch in Jammu region remained closed since December last year due to accumulation of several feet of snow which has now frozen. Anantnag in south Kashmir to Kishtwar in Jammu region road also remained closed due to snow. The road has become unpredictable as once landslides are cleared at one place there are shooting stones at some areas, official sources told TNN this morning. We were about to allow traffic on Monday when there was fresh huge landslides at Maroog and intermittent shooting stones between Raban and Banihal stretch, they said adding the road has become very unpredictable. They alleged that the agencies engaged in construction of four-lane road widening has failed to take proper steps before starting the work due to which intermittent shooting stones and landslides has become a routine. However, a traffic police official told TNN that efforts are going on to restore traffic on the highway to clear the stranded vehicles. He said only stranded vehicles, particularly trucks, would be allowed to move towards Kashmir. The beached truckers alleged that government failed to make any arrangement for their stay. However, we have so far survived because of local residents who are providing us food and water, the truckers and passengers stranded at Qazigund and other places on this side of the Jawahar tunnel said. Meanwhile, an official spokesman said that a huge snow avalanche had blocked one tube of the tunnel when eight persons, including policemen, firefighters and two accused were killed on February 7 when there was heavy snowfall in the area. Now the avalanche has been cleared to allow traffic, he added.